Just a reminder, Economics extra credit projects are due tomorrow, we will present on Tuesday and our test will be on Wednesday. Math – We will continue our measurement unit this week. The students will be learning about how we exchange and use resources, which includes earning Hoke coins in our classroom. The students will earn them for turning in completed homework, reading, behavior, etc. With the coins they earn they can purchase small items from “Hoke’s Market.” It’s a fun unit and help the students to understand how our economy works and what it means to save. April 1st we will also begin our Junior Achievement program with Deb Holt. More info about this to come. We began a new, but short chapter on time. Our test on this chapter will be next Wednesday. In order to help your child learn about clocks and time, please use any and every opportunity to have them tell you which hand is the minute and hour hand or ask them what time it is. Today we learned the phrases, “quarter past” and “quarter till.” Any real-world practice is very helpful! This is also true for counting money/coins. Lesson 21 test will be on Tuesday, March 26th. FRIDAY, MARCH 22 WILL BE AN EARLY DISMISSAL AT 1:30! We will be having Book Exchange tomorrow, March 12th. Our class is awesome at remembering our books each week! Today I will be sending home our field trip permission slips. This year we will be going to the Fulton Theater to see The Princess and the Pea and then we will walk over to Lancaster Central Market to get soft pretzels. We will then head to Charlestown Park for lunch and some play time. The field trip isn’t until May 17th, but we will need the permission slips back by March 22nd in order to plan accordingly. Thanks so much! Celebrating Dr. Seuss this week! Math: We just wrapped up our unit on money/coins, the students really enjoyed it! We have now moved into our “data analysis” chapter and the students are learning all about different types of graphs, this is personally one of my favorite math chapters. 🙂 I will keep informed of when our test will be. Science – We have started our chemistry unit. This is a fun chapter learning all about matter, we perform a lot of fun experiments! Spelling: We will have our next spelling test Friday, March 8th. 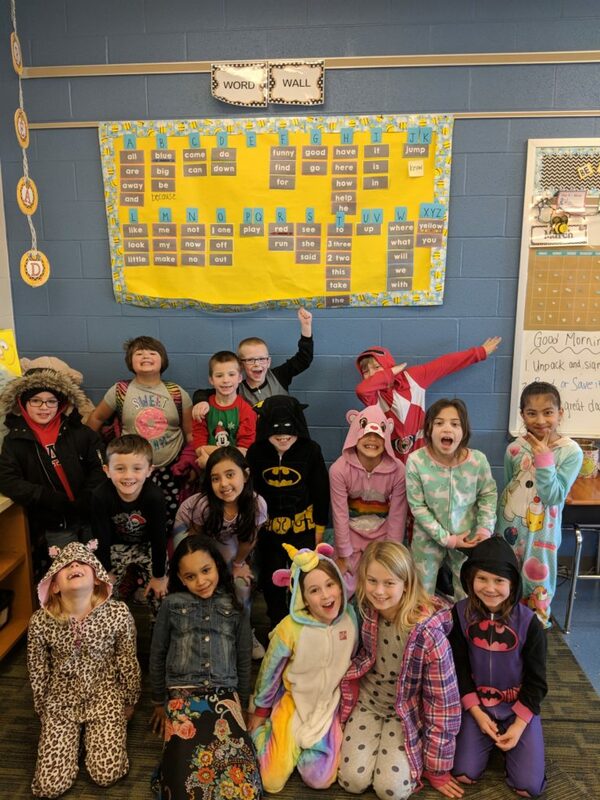 2-Hoke earned their reward of pajama day and lunch in the classroom! A few quick updates! First off, let’s hope for no more snow! Tomorrow, FRIDAY, FEBRUARY 22nd our entire school will be celebrating career day. We encourage the students to dress up as someone they would like to be when they are older (nurse, teacher, scientist, etc.). I’m excited to see all the different careers! We WILL be having our National Symbols test tomorrow. Math, Chapter 8 test on money will now be MONDAY, February 25th. Hello everyone! It looks as though we will have a full week of school! **Wednesday, February 6: We will have our Lesson 16 Spelling Test and our Chapter 7 Math test. **Friday, February 8 will be our field trip to the North Museum. We will be leaving school at 9:15 and returning at 12:30 p.m. Students may either bring a bagged lunch, or please return the orange slip so that our cafeteria can provide a bagged lunch for your child. **Next week: We will have our Valentine’s Day Party February 14th. I will be sending home a list of students in our class along with a donation sheet, if you would like to donate any treats to our class party. **U.S. National Symbols extra credit project will be due February 14th and we will be presenting them to our grade level on February 15th, since school will now be in session. Our U.S. National Symbols test will be Wednesday, February 20th. Due to the snow forecast for this afternoon, Penn Manor will be dismissing early today and will be canceling afterschool and evening activities. Secondary students in 7th through 12th grade will be dismissed at 11:00 am and elementary students in 1stthrough 6th grade will be dismissed at 12:00 pm. Morning kindergarten will be dismissed at the regularly scheduled time of 11:30 am. There will be no afternoon kindergarten. Tomorrow is CRAZY hair day and an early dismissal! We will also be having our Lesson 15 Spelling Test, which are all review words. NEXT Friday (February 1st) we will be celebrating our 100th day! Thursday, January 31st, the 100 items/objects extra credit project is due. If you have any questions about that please let me know! The following Friday, February 8th we will be having our field trip to the North Museum, I know I’m just as excited as the students are! It should be a really fun morning. Be on the lookout for class lists for Valentine’s Day. We will be making our own bags to collect the Valentine’s, in class. Tomorrow will be our Lesson 13 spelling test! Thursday will be our Chapter 6 math test on 3-digit addition.